Mention “ramen” to most people and you’ll get a weird look followed by “you mean the stuff in the cup?” or others might remember the college days when your “pantry” consisted of packets of Kool-Aid and instant ramen noodles since both could be bought in large amounts for not a lot of money. In any case, it’s not likely to evoke a good reaction to anyone that isn’t aware of how ramen noodles are prepared elsewhere in the world. 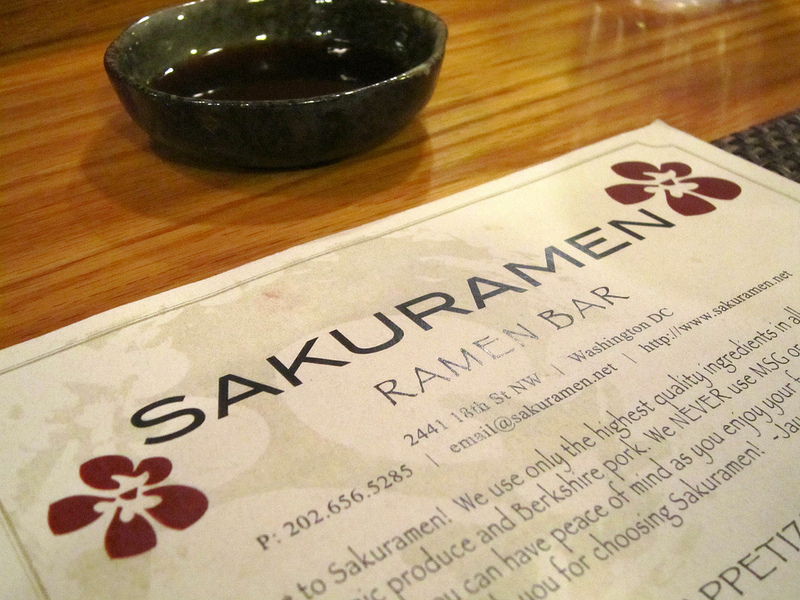 So when a friend suggested Sakuramen in Adams Morgan a few weeks back, I was intrigued but skeptical, after all, even if it isn’t instant, it’s still just noodles and broth, right? Well that is true, but completely undersells the experience. Since my first visit, I’ve been back twice and it’s a welcome comfort each time. When it’s chilly outside, ramen is warm and filling and with flu season upon us, there’s nothing like a good soup to make you feel better. 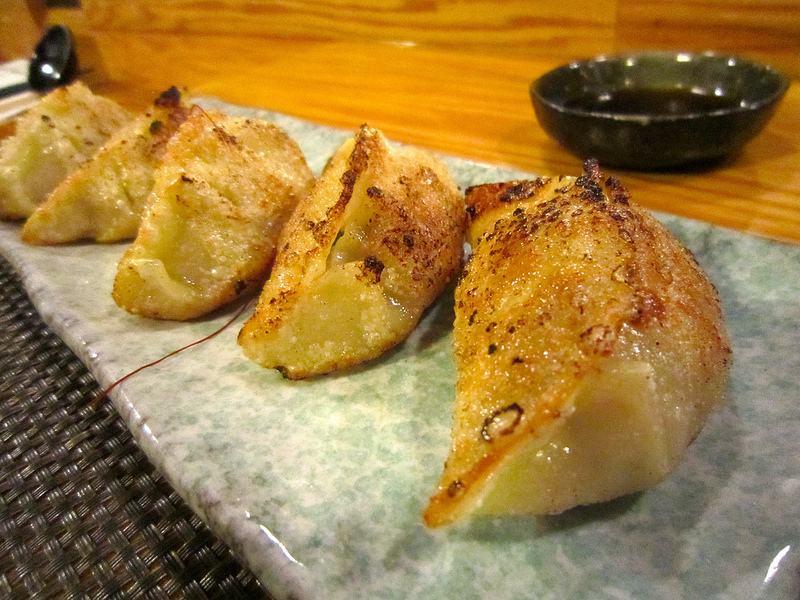 Especially if you’re like me and start with Gyoza (or Jiaozi, Dumplings, Potstickers, whatever you like to call them). Dumplings are one of my food addictions, no matter how much I plan to eat, I have to start with them if they’re on the menu. Steamed if I’m trying to be healthy, fried if I just don’t care. You get a nice serving of five which is perfect for sharing… just not with me! 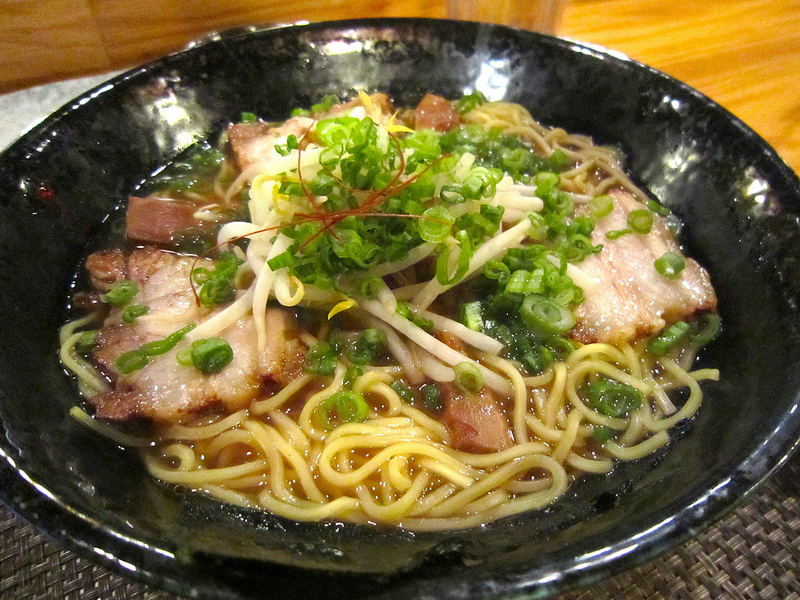 I went for the Gojiramen: traditional shoyu (soy sauce/chicken stock broth) ramen with chashu (roasted Berkshire pork), menma (marinated bamboo shoots), scallions, nori (seaweed), and sprouts. I’ve had the Shoki bowl before as well and both were delicious and had me tipping the bowl after finishing to slurp up a bit more broth. Speaking of slurping, if you’ve ever seen the Spaghetti scene from Tampopo, you’ll know what I’m talking about, but slurping is definitely not frowned upon here. A few more pictures are up on flickr, but I didn’t really “chow down” on this visit. A gentleman seated near me made the mistake of ordering too much and had to have his appetizers boxed up to take with him. There are other delights on their menu that I look forward to trying on future visits, but this little out of the way place is enough to get me down to Adams Morgan on a more regular basis and that’s saying something. I certainly won’t look at ramen the same way anymore and no microwaved cup with a seasoning packet will ever cut it again. Next story blog: still here!